The Escuela de Tango de Buenos Aires is an enterprise entirely dedicated to Tango. It is through Tango that we understand culture. It is a way of life. It is a way to see our own lives in the context of realities such as society, individuality, beauty, responsibility. These words seem abstract, but they manifest as real problems in our everyday life. Tango lends the experience of past generations, gives us the perspective of how people in the past lived and danced, of the mistakes they made in the process. It offers us the opportunity to make better choices in the present, and through our sense of responsibility, personal strength and awareness, to make life more beautiful. Tango shows us that our individual lives are meaningless without a connection to past generations and traditions that link us to others in the present and throughout history. Passion for life, which we can only achieve and sustain through our subjectivity, is necessary to give meaning to our lives and make valuable contributions to society. que escuchen los que quieran escuchar. This first verse talks about society, made up of uncountable individuals driven by their own passions: dancing, enjoying the music… there is something in tango for everyone. Tango is for all. In these lyrics the individual presents his motives: passion, emotions. Still, these passions are related to something that transcends him as an isolated individual: Tango. This verse demonstrates how he is moved by responsibility of responding to a call from Tango and others. I am not going to talk about the dance. You must do it, if you want to know anything about it. It is pure beauty. The Escuela de Tango de Buenos Aires is based in Buenos Aires, where it has a staff of regular and guest maestros such as Olga Besio, Blas Catrenau and Luciana Guido, Myriam Pincen, Néstor La Vitola, Verónica Olivera, among many more, and Néstor Pellicciaro, who is also one of the co-directors. The other co-director (and author of this article) is me, Marcelo Solis, working in San Francisco Bay Area. ETBA also has branches in Europe and Asia. Since tango is a globalized phenomenon that is rooted in Buenos Aires, we promote a strong connection to the roots of tango at each branch abroad. Teachers at every location organize classes and events keeping in mind that their goal is to see their students dancing in Buenos Aires’ milongas, helping them to integrate to the milonguero culture. I recently came back from Buenos Aires where I was guiding my tour. The experience was very positive, and all of the participants became better dancers. That makes me feel deeply happy and proud. And now the question is… what makes you a good dancer? 1. To be madly in love with the music. Tango originates as a dance first, and then a specific music was associated to it. The first milongueros would dance using the particular technique of dancing based on the embrace, to the rhythms in vogue at the second half of the 1800’s: waltz, polka, habanera, that came to the port of Buenos Aires from abroad, and a local rhythm called milonga. Musicians were itinerant at the time. They played improvisations based on popular melodies, and received payment directly from the dancers. The musicians who paid attention to the dancers learned to play to their cadence, the natural inertia of a couple dancing embraced. That was greatly appreciated by the dancers and rewarded with a greater pay. That is how tango evolved as a musical genre. This process went on, with a period where tango was partially disassociated from the dance; the tendency that today, in retrospect, we relate to Carlos Gardel, a singer, and Julio De Caro, a violin player, composer and director. 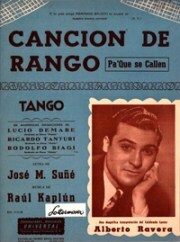 It lasted until 1935, when Juan D’Arienzo initiated the Golden Era of Tango by reconnecting tango to its roots as a dance. The music from that period (that continued strong for a decade, and faded out gradually after –although never completely disappearing) is played nowadays in the milongas in Buenos Aires. That is why it is not possible to understand Tango without passionate love for its music. The music tells you how to dance, tells you what tango is. To read more about the history of Tango, click here. 2. To have the patience to achieve a great control of your movement, up to the “subtleties” level. Be never satisfied with what you are already able to do. However, do not allow the quest for improvement deprive you and your partner of the joy of dancing. 3. To have the passion and the commitment to practice, to put aside other things and make time to practice. Nothing will change or improve in your dance without physically doing and repeating your exercises in order to build up the necessary good habits. I heard people saying that this is neurotic obsessive behavior, an addiction, and other similar things. My response to them is: when an activity makes you stronger, wiser, more aware and alert, healthier in general, it cannot be classified so negatively. Although, for some, it may be an escapism… But that is not Tango. 4. To be generous, pay more attention to your possibilities and opportunities to give, rather than calculating how much you would receive. I tell you right away: it may be a long time before you can truly enjoy it. It is always going to be a work in progress that is never finished. It will ask you to be always in alert mode, to consider more what you can do and how much you can give, not how much good it is given to you. From the moment you go to your first class or your first milonga, the right attitude will be “I come to participate”, rather than “I come to receive”. 5. To have the desire to share, pay attention to your partner’s joy, to dance “with” your partner. That is the same principle stated in 4, but on the partnership level. At the couple level, tango is made by two people. They have to act as accomplices, give support to each other, encourage their respective strengths, provide support and a friendly challenge in relation to their respective weaknesses. 6. To respect the other people’s space. Tango is intimate, but should not be invasive. That is why, to give one example, “cabeceo” is so essential to tango: you ought to ask a partner from a distance if she or he would allow you to get so intimately closed. A milonguera or milonguero has to be aware of the following: a good dancer is clean, well mannered, respectful, strong, considerate and gentle. 7. To be humble, even when you have a lot to be proud about. The greatest of the greatest dancers keep learning. 8. To be aware that Tango is not only “your” Tango, to acknowledge that it has belonged to others before you, to respect what Tango is, so your love for Tango grows on the soil of what has already been done. That implies your acting in order to know tango better, its history, the people who made Tango their lives. 9. To assume responsibility that others who come after you will get to know Tango from you. You may also like to read “What it means to be a good student“, click here. “What is Tango?”, click here. Also “Dancing is a lot more”, click here. Before describing the characteristics of what I consider to be a good tango dancer, I want to disclaim that my appreciation and opinion is for the tango dancers I see and interact with in the milonga, particularly those that form the pulse of the dance floor in synchrony with the music’s beat. I want to acknowledge that for many people, the fast, flamboyant and exuberant moves of some dancers are admirable, and I won’t deny that; but my respect goes for the people that form and embrace the community of tango interested in preserving the essence of the dance; connection. I’ve noticed that the tango dancers I admire have a common characteristic; their generosity. They are generous with themselves, to their dance partners, to the other dancers on the floor, and last but not least, they are generous to the other milonga patrons. Tango dancers I admire, both men and women, love the music and their love for the music is palpable. They are generous with themselves listening tango throughout the day, every day. The pride in their dance craft has lead them to take (or have taken) innumerable classes, to practice routinely and to go to as many milongas as they can, to dance and be part of the tango community. Their love for Tango music and for the emotions it stimulates, together with the time and effort they’ve put into their dancing crafts, allows them to be generous with their dance partners. The essence of this generosity is the willingness to experience the connection evoked by the music and moving ‘heart to heart’ with their dance partner. This generosity starts with the cabeceo and begins to materialize in the embrace. In the comfort of the embrace the woman (aka follower) feels safe to responds to the man’s (aka leader) offerings of spaces to move into. Aside from an erect posture and clarity of movement, good ‘leaders’ follow their partners by consistently checking her steps and noticing her level of comfort, adapting their posture, embrace and movements to enhance the comfort and sense of ease in their partner; and by raising the communication bar when the skills and rapport allow it. In the same token, good ‘followers’ are graceful; and their work and effort on their dancing craft provide them with the skills and attention to not cling or squeeze their dance partner for balance and support. Good ‘followers’ are attentive to the space offerings and refrain from guessing steps or moves (i.e. they dance with their partner, not by themselves or with their imagination). A milonguero friend of mine once pointed out that “Tango lives in the milonga”, and that “it’s in the milonga where tango’s full expression is embraced and displayed by dancers and the patrons in the milonga”. When people practice at home, or those that practice in the supermarket, they are not required to follow the line of dance, an essential component of common respect for dancing in a milonga. If you are reading these lines you must have reached the legal driving age and likely you have had the experience of seeing in the highway a driver simultaneously using two lanes or swirling between lanes. Have you noticed dancers acting in the same fashion in the milonga, without regard for the other dancers on the floor? While inconsiderate drivers annoy and endanger us, if their reckless driving is observed by a highway patrol officer they will be stopped and cited to deter such behavior. But in the milonga, what happens with the reckless ‘leaders’ that choose to ignore the line of dance, swirling across lines and other dancers ? Unfortunately in the SF Bay Area nothing happens. In Buenos Aires however, I know of at least one organizer that, to keep the dancing quality of his milonga, will deter inappropriate dancing behaviors by first giving a warning (yellow card) and if the behavior persist kicking the infractor out of the milonga (red card). In other words, the milonga is like a sanctuary and good tango dancers know, appreciate and follow the codes of the milonga; they understand that following the line dance, practicing cabeceo and general rules of etiquette are essential for personal and communal enjoyment of tango. Finally, good tango dancers see tango and the milonga as a community and thus integrate and participate with all who are present; they are generous with their smiles, handshakes, jokes and stories; they build community. Good tango dancers have a deep appreciation for the effort made by the organizers to offer a milonga with evoking rhythms and the warmth of a good embrace.